Figure A40. Hispaniola anomaly, interpreted as the Hispaniola slab, with (horizontal) [vertical] cross sections through (A)[D] the UUP07 p-wave) and (B)[D] the combined SL2013 and S40RTS s-wave models at 870 km; C) the location of the modern geological record that we interpret to have formed during the subduction of the slab. The Hispaniola anomaly (Figure A40) is detached and located below the island of Hispaniola in the northern Caribbean region, at a depth of 800-1400 km. It was first identified by van Benthem et al. (2013), who interpreted it as the nGAC slab (northern Great Arc of the Caribbean). We name the slab Hispaniola according to its current location. Its detached nature and location in the top of the lower mantle and its position west of the Caribbean slab and east of and above the Cocos slab suggests that it should be correlated to a geological record of past Cretaceous or Paleogene subduction in the northern Caribbean region. Van Benthem et al. 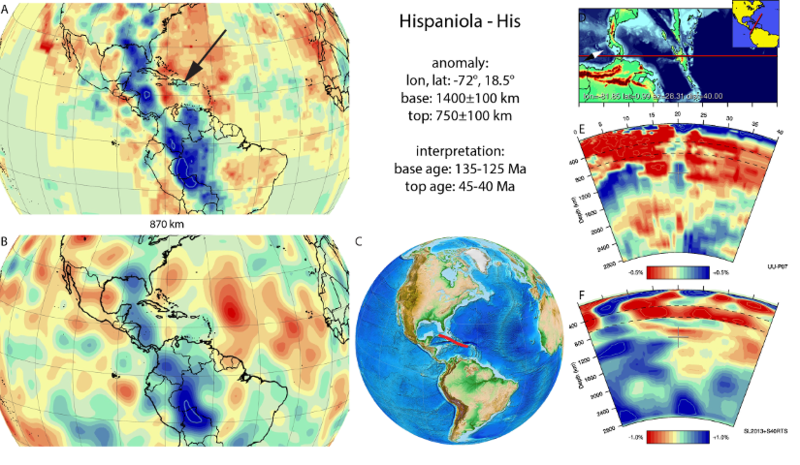 (2013) interpreted this anomaly to represent lithosphere that subducted below Cuba and Hispaniola in Cretaceous to Eocene time, which decoupled from the Venezuela slab, or ‘sGAC’ slab in terminology of van Benthem et al. (2013), upon the Paleogene northward retreat of the Cuba segment relative to South America (see also Pindell and Kennan, 2009; Boschman et al., 2014). Cuba and Hispaniola show a history of subduction of the North American plate, comprising oceanic Proto-Caribbean lithosphere, a microcontinental terrane, and the North American continental margin below the oceanic Caribbean plate represented by ophiolite and arc rocks (García-Casco et al., 2008; Pindell and Kennan, 2009). The oldest record of subduction in Cuba is represented by ~130±5 Ma volcanic arc and high-pressure, low-temperature metamorphic rocks (García-Casco et al., 2006; Stanek et al., 2009), and subduction terminated between 45 and 40 Ma shown by the youngest foreland basin deposits and oldest overlap assemblages (Iturralde-Vinent et al., 2008). These findings are very interesting for us. Until now, I haven’t seen interpretation like this one. As far as I know, the northern limit between Caribbean and Northamerican Plates is between southern Cuba and Jamaica, traced by an strike slip boundary type that goes until Haiti. It would be interesting to analysed this diference with your model.